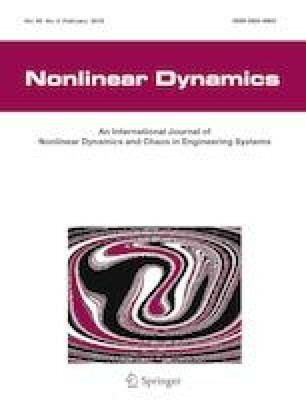 This paper proposes a new nonlinear system identification method in time domain for a small-scale flybarless unmanned helicopter based on an adaptive differential evolution algorithm. By analyzing and processing the real input and output data, a nonlinear parametric model including heave dynamic model, yaw dynamic model and longitudinal–latitudinal subsystem is established. The validity of the identified model is confirmed through comparing the output of the mathematical model with the actual flight response under the same control input. In addition, a power-based identification strategy is propounded to reduce the difficulty of data acquisition and improve the efficiency of the identification process. Moreover, the trajectory tracking controller is designed and implemented based on the identified model using the backstepping control technology. The actual autonomous flight experimental results further demonstrate the accuracy of the identified nonlinear model and the effectiveness of the proposed control method. This work was supported in part by the National Natural Science Foundation of China (Grant No. 61603407) and the Basic and Advanced Research Project of ChongQing (Grant No. cstc2016jcyjA0563). The authors of this paper owe great thanks to Dr. Peng Li and Mr. Xuanying Li for their disinterested assistance in outdoor experiments.